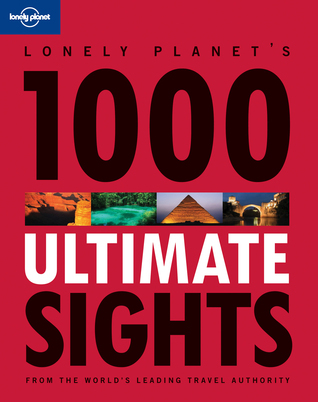 Great travel/photo book, with separation of Sights by Categories of the Best.Mightiest Monoliths--Devil's Tower in Wyoming is in here--the first National Monument. Want to See!Best Underground Sights has NM's Carlsbad Caverns.Best Literary Sights includes Stratfore-upon-Avan and the Hemingway House in Key West.But it is the Most Mysterious Sights I really want to see--Himalayan Yeti, Easter Island, Crop Circles, Nazca Lines, Stonehenge, Loch Ness, and Area 51 (how come I never made it there?). Roswell is the only location I have actually made it to. Sad.In 1986 I observed the wonderfully cute Parade of the Fairy Penguins on Phillip Island, Australia. Sorry to see that did not make it onto the Most Amazing Natural Phenomena--but the Red Land Crabs of Australia did!The Rain of Fish in Honduras sounds interesting too!Under Most Intriguing Clocks and Calendars, I have seen the Sun Dial Bridge over the Sacramento River, CA. But I would really like to see the shadowy plumed serpent descend the pyramid at Chichen Itza.Glad to see that I have snorkeled and skindived at two of the Most Impressive Coral Reefs--Great Barrier Reef, and the Belize Barrier Reef.Of the Most Unusual Fountains, I have seen the Trevi Fountain in Rome, and the Bellagio Fountain in Las Vegas. On my to-do list is the Crown Fountain in Chicago, as it is very near the beginning of Route 66!Glad to see that I have made it to at least one of the Greatest Bookshops--Powell's City of Books, in Portland, OR. Largest independent bookstore in the country!Sorry to see that the sunrise at Haleakala Crater on Maui is not listed among the Greatest Sunrises and Sunsets. The sunrise view at the crater rim was well worth getting up a 4 a.m. for the long drive up the volcano. Awesome!Looks like I have conquered two of the Mightiest Rivers--rafted the Colorado River through the Grand Canyon, and speedboating on the Shotover River in New Zealand. Still hope to one day make it to the Nile and Yangtze Rivers.most Unusual Lakes lists Crater Lake--just cross-country skied there 3 weeks ago!Glad to see that central New Mexico's Lightning Field earned a mention in Soaring Spires and Needles. Never did visit there, but read quite a bit about it.A fascinating read for the travelers of both the real and armchair varieties! Une compilation intéressante de lieux à visiter, classés par catégories, allant de l'incontournables à l'insolite, du plus populaire au plus secret. On ne s'y référera pas au cours d'un voyage, ni même pour la préparation. C'est davantage un livre que l'on ouvre au hasard pour s'évader quelques minutes au fil d'une poignée de pages avant de revenir à la réalité. great index - organized by countries at the end. appreciate that. the sights are great - i haven't been to even a tenth, but the ones i do know are all excellent. the mexican and argentine ones were great representations of what those countries have to offer. this was from the library, but i'll buy. Needed more pictures, reading about beautiful places is one thing but a much better statement is a photograph. I love the pictures in this book. They make me want to travel everywhere!